(LOCATION: Fort Lauderdale FL) Striker sport fishermen are in a class of their own. This Custom 44 Sport Fisherman is a big, brawny, fishing machine with great styling, outstanding accommodations, and exceptional performance. She had a total hull and interior refit in 1999 and was repowered in 2006. 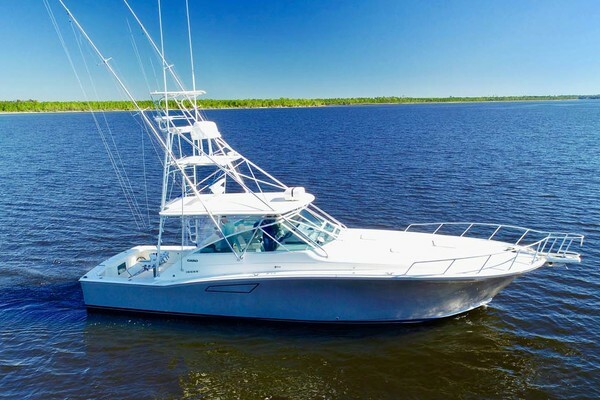 This custom sport fisherman has classic good looks, towering bow, high deck rails, above deck salon with large windows, walkaround bridge deck with single seat pilothouse, and spacious cockpit.. The flybridge features a single seat pilothouse with Stidd captain’s chair. The helm features a full complement of electronics including: Raymarine E120 display with: GPS radar, chartplotter, color fish finder, Navtronics chip, 24-mile open array radar, Raymarine ST8001 autopilot, Raymarine Ray 24 VHF radio, and Ritchie 6" compass. The bridge is equipped with walkaround deck, high rail, rocket launchers, spotlights, and flood lights. The large cockpit gives you more than enough workspace. The foredeck includes stainless steel bow rail and bow pulpit with teak grate and roller, anchor and windlass. The interior is large, open, and comfortable. The cherry finished interior has large windows with venetian blinds. The upper salon has room to relax, dine, or entertain. Just a couple steps down is a full galley with stand-up refrigerator/freezer, microwave oven, cabinets with solid surface counter with stainless steel dual sinks, and dinette. For overnight and extended fishing trips there are two staterooms. The lower head has vanity, and shower. The upper day head has electric marine toilet. Performance is provided by twin Detroit Diesel turbocharged engines. They are 1997 models that were installed new in 2006. Mechanical features include: NorPro generator, Flagship 3-zone reverse cycle HVAC, water heater, and engine room fire suppression. She is a good-looking, well-equipped sport fisherman with tons of room. If you are serious about fishing in style or looking for an exceptional cruiser call now for more information and to schedule a showing of this 44’ Striker Custom Sport Fisherman.